Once upon a time, two people met in Shanghai, China, and took their love on the road, exploring the region and soaking up the culture. The experience inspired Rachel Huang and Jason Faulkner, now married and living in Massachusetts, to launch a new venture that celebrates contemporary Asian textile design. The name of the company -- Happy Scarf -- says it all. The brightly colored scarves have an energetic, whimsical vibe. Yet they’re also sophisticated. Rachel deftly chooses patterns that are bold and unconventional, but also modern and wearable. 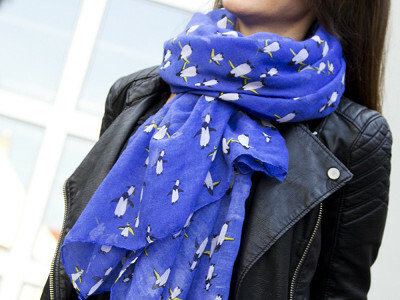 A great scarf can transform a ho-hum outfit into something memorable without a lot of effort. Even better is a scarf that can transform your mood. Happy Scarf has that effect. The minute you put one on, it’s hard not to smile. And that’s just the beginning. someone falls in love with our new favorite colors, fabrics and designs. 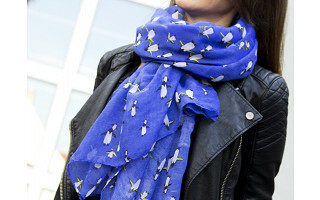 I love your story and the scarves are gorgeous and whimsical! I noticed Tree of Life is already out of stock! I would love that particular print. Will they be available anytime soon? I would also like to order the black and white scarf. When will you have more in? Does the tree of life scarf have an image of a tree printed on it? I cannot tell on the model. @ Jodean: There's a beautiful Tree on the scarf. @Ianthe & @Joanne Benton: Thank you for the shout out on interest in the Tree Of Life black/cream scarf. Stay tuned; checking to see why it's not available. More Tree Of Life black/cream scarf will be added today. Thank you for your interest. @Barbara Dunleavy: What a beautiful way to welcome a child to our world. Will be sure to let you know directly when available. Please tell me the fabric content of this happy scarf. @artistwagoodi: Depending on the scarf that brings lots of joy to you, it's made of 100% Viscose or polyester. The info is in the DETAILS tab (under video & photos). Love the scarf and thrilled to see one of your models on the video is current America's Top Model contestant Leila! @ Francyn Great Eye! that is Leila from ANTM, we were really lucky to work with her before she was on the show. Rachel loved her look after she saw her in a model casting and Leila always takes amazing photographs. These items are terrific! Plus, I love that you are practically right in my own backyard. I try to always support the local businesses around me that I love and you guys definitely qualify. Best of Luck to you and your family business. Keep it up! Received my red Zebra Crossing scarf today. It is beautiful and so versatile. it will make a wonderful holiday accent to my wardrobes. Thank you so much. I love green and blue and hope a scarf in those colors comes out soon....just a hint. I meant Rachel is wonderful !!! Once upon a time, two people met in Shanghai, China, and took their love on the road, exploring the region and soaking up the culture. The experience inspired Rachel Huang and Jason Faulkner, now married and living in Massachusetts, to launch a new venture that celebrates contemporary Asian textile design. The name of the company -- Happy Scarf -- says it all. The brightly colored scarves have an energetic, whimsical vibe. Yet they’re also sophisticated. Rachel deftly chooses patterns that are bold and unconventional, but also modern and wearable.